― Margaret Atwood, The Handmaid’s Tale. Fatigue or tiredness is a common medical complaint that may seriously affect people’s quality of life. However, despite many possible underlying causes, a specific medical disorder is seldom revealed. On the other hand, mood and anxiety disorders are commonly associated with fatigue. Fatigue is regarded as a nonspecific symptom as it is not typically associated with a particular disease. It is one of the most common complaints reported to medical care providers. Contrary to many other medical symptoms, fatigue is an entirely normal phenomenon in particular situations. We all become tired, but it usually gets better by rest or sleep. However, chronic fatigue as a medical symptom is typically persistent and not relieved by rest. The words lethargy and malaise are sometimes used to describe this condition. Approximately 6-7 percent of the population experiences fatigue at any given time, and 24 percent of people will suffer from fatigue at some time during their course of life (1). Most studies show that fatigue is more prevalent in women than in men. One study showed that 24 percent of primary care patients consider fatigue to be a significant problem (2). It is estimated that fatigue will result in approximately seven million office visits per year in the primary care setting in the United States (3). However, despite the frequency of medical utilization, one study found that only 10 percent of patients in an internal medicine clinic were found to have a medical cause for their fatigue (4). Fatigue caused by an underlying medical condition such as a viral infection, anemia or hypothyroidism will usually clear up when the underlying condition is treated. That’s different from chronic fatigue which is persistent and is usually not be explained by a specific underlying medical condition. Fatigue that is present for more than six months is regarded as chronic. An underlying medical or psychiatric condition can explain chronic fatigue in approximately two-thirds of the patients (5). The three major underlying psychiatric illnesses are depression, panic disorder, and somatization disorder (6). Chronic fatigue syndrome (CFS), also known as systemic exertion intolerance disease (SEID) is regarded as a separate disease entity. Studies have indicated that approximately 15 percent of patients with chronic fatigue suffer from CFS (7). Apart from affecting the quality of life, fatigue may negatively impact family life, social relationships, and performance at work. Consequently, it should be regarded as an essential public health issue. However, as so often with nonspecific symptoms that cannot easily be explained or fixed with a prescription or another simple measure, fatigue, as long as it is not caused by a severe medical disorder, often tends to be stashed away. Fatigue is a generalized perception of weakness or feeling worn out, drained or depleted. Sometimes a distinction is made between physical and mental fatigue. However, in many cases, these occur together. Physical fatigue is a reduced capacity to maintain physical activity or an inability to initiate physical tasks. However, mental fatigue is characterized by difficulties with concentration, memory, and emotional stability (8). It is important to differentiate between daytime sleepiness and fatigue. Sleepiness is the inability to remain fully awake or alert during the day whereas fatigue is a subjective lack of physical or mental energy interfering with daily activities. Daytime sleepiness is a key feature of obstructive sleep apnea (9). Fatigue should be distinguished from dyspnea and muscle weakness. Dyspnea describes a sense of breathing discomfort or difficulty in breathing. It is often expressed as feeling out of breath or suffering from breathlessness (10). Muscle weakness implies lack of muscle strength and is associated with several neurological and skeletal muscle disorders. Of course, patients with dyspnea and muscle weakness may also complain of fatigue. The duration of fatigue can be recent (less than one month), prolonged (more than one month), or chronic (over six months) (11). Chronic fatigue syndrome (CFS) is a disorder characterized by chronic fatigue, has no apparent cause, and is accompanied by cognitive difficulties (12). Examples of cognitive problems include verbal dyslexia and difficulties with short-term memory. It is estimated that between 836.000 and 2.5 million individuals are affected by CFS in the United States (13). CFS has also been named systemic exertion intolerance disease (SEID) to better reflect the condition’s hallmark which is post-exertional malaise. Post-exertional malaise describes a massive energy crash after a relatively minor exertion. Generally, if this condition is accompanied by cognitive difficulties, it is referred to as CFS. The cause of CFS is unknown, but it is believed to be an infectious disease with immunologic manifestations. There is often a history of an antecedent infection that precipitated the prolonged state of fatigue following the initial illness. Some have suggested that the infectious agent responsible for CFS is Chlamydia pneumoniae. A recent study suggested that a blockage of a key metabolic enzyme could explain the profound lack of energy and other symptoms experienced by patients with CFS (14). The study suggests that patients with CFS have a reduction of amino acids that fuel oxidative metabolism, pointing to functional impairment of pyruvate dehydrogenase (PDH), a key enzyme for the conversion of carbohydrates to energy. Hence, the cells might switch to consumption of alternative fuels, causing a sudden shortage of energy in the muscles and a buildup of lactate, experienced by patients as a burning sensation in their muscles after minor exertion. There is no specific diagnostic test for CFS. The diagnosis is based on clinical criteria, which are further supported by certain nonspecific tests. The absence of cognitive dysfunction should exclude CFS as a potential diagnosis. In 2015, the following diagnostic criteria were proposed for CFS by the Institute of Medicine (IOM)(15). The first step in the evaluation of patients with chronic fatigue is to screen for an underlying medical or psychiatric illness. If no such disorders can be found and the patient does not fulfill the criteria for the chronic fatigue syndrome (CFS), he/she may be considered to have idiopathic chronic fatigue. The word ‘idiopathic’ reflects an unknown underlying cause. Disability rates and need for healthcare is similar for patients with idiopathic chronic fatigue and CFS (16). Fibromyalgia is a chronic pain syndrome characterized by widespread nonarticular pain, stiffness, and fatigue. Cognitive complaints, known as fibrofog, are present in 90 percent of patients (17). For years, fibromyalgia has been regarded as a controversial condition. In most cases, no abnormalities are found on physical examination other than tenderness in certain areas affected. Laboratory and radiographic findings are normal. Thus, the role of organic illness has been questioned, and fibromyalgia has often been considered to be of psychogenic or psychosomatic origin (18). Modern brain imaging has provided new insights into the mechanisms involved in fibromyalgia. Recent research suggests that fibromyalgia is a disorder of pain regulation, linking fibromyalgia to changes in brain activity (19). Fatigue is a universal symptom of fibromyalgia. It is often most marked when arising from sleep in the morning. A typical quote is “No matter how much sleep I get, it feels like a truck ran me over in the morning (20).” Minor activities often seem to aggravate the fatigue. Fatigue may be caused by several underlying medical conditions. However, among patients with chronic fatigue, only a small proportion (approximately 10%) will have an underlying medical disorder as the primary cause of their symptoms. Laboratory studies should include complete blood count, chemistry screen (electrolytes, glucose, renal and liver function test), thyroid stimulating hormone (TSH), and creatine kinase if muscle pain or weakness is present. Screening for occult hepatitis C viral infection may sometimes be appropriate as well as screening for HIV. These tests should reveal most common medical disorders potentially causing fatigue. Anemia is a medical condition in which the red blood cell count is below normal. Patients with anemia typically experience fatigue and loss of energy. Iron deficiency anemia is the most common type of anemia worldwide. It is commonly caused by blood loss such as from heavy menstrual bleeding or bleedings from ulcers or tumors in the gastrointestinal tract. Anemia may be caused by a deficiency of B-12 and folate. Many chronic diseases such as cancer, rheumatoid arthritis, and kidney disease may cause anemia. Hypothyroidism is a condition in which the thyroid gland doesn’t produce enough of the thyroid hormones known as T3 and T4. Fatigue is one of the leading symptoms of hypothyroidism. Other symptoms include increased sensitivity to cold, constipation, dry skin, hoarseness, muscle weakness, muscle aches, thinning hair, depression and impaired memory. The pituitary gland responds to diminished levels of T3 and T4 by increasing the secretion of thyroid stimulating hormone (TSH). Hypothyroidism is usually detected by elevated blood levels of TSH. Treatment of hypothyroidism with synthetic thyroid hormone is usually simple, safe and effective. Many people with diabetes describe themselves as feeling tired, lethargic or fatigued at times. Fatigue may be caused by an imbalance in blood sugar levels. It may be present when blood sugar is high and when it is low. People with diabetes may also experience chronic fatigue that is not always related to their blood sugar levels. This phenomenon is known as diabetes fatigue. Hypothyroidism and diabetes mellitus are examples of endocrine disorders known to cause fatigue. Several other endocrine and metabolic disorders are associated with tiredness (21). Examples are hypogonadism (22), hyperparathyroidism with associated hypercalcemia, adrenal insufficiency (adrenal fatigue), apathetic hyperthyroidism, growth hormone deficiency, and glucocorticoid resistance (23). Several chronic infections may cause fatigue. Examples are endocarditis (an infection of the heart valves), tuberculosis, mononucleosis, hepatitis, parasitic disease, HIV infection, and cytomegalovirus. Additional laboratory tests may be necessary to reveal these disorders. Sometimes, in response to an unknown trigger, the immune system may begin producing antibodies that attack the body’s own tissues. This may lead to a chronic inflammatory response and is characteristic for most autoimmune disorders. Examples of autoimmune disorders are rheumatoid arthritis, systemic lupus erythematosus (lupus, SLE), inflammatory bowel disease (IBD), multiple sclerosis (MS), type 1 diabetes mellitus, Guillan-Barre syndrome, psoriasis, Graves’ disease, Hashimoto’s thyroiditis, and myasthenia gravis. Fatigue is a major component of autoimmune disorders. 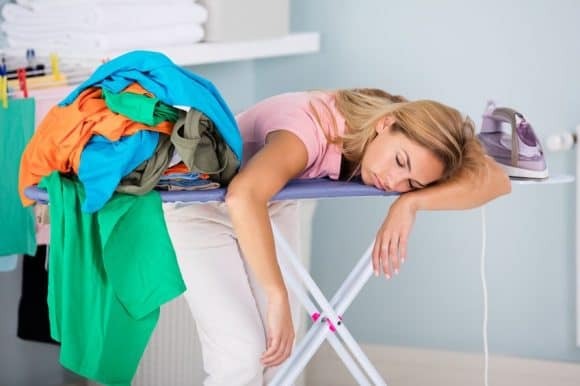 Tiredness described as “profound,” “debilitating,” and “preventing them from doing the simplest everyday tasks,” is a major issue for many patients, impacting nearly every aspect of their lives (24). Chronic fatigue is prevalent in people with cancer and can often be the most troubling symptom. This type of tiredness is sometimes called cancer-related fatigue or cancer fatigue. Fatigue is now overshadowing pain and nausea/vomiting as one of the most feared symptoms of cancer and cancer treatment (25). Cancer-related fatigue may be caused by the disease itself. Sometimes, tiredness is the first symptom of cancer. However, people with advanced cancer are more likely to have fatigue than people in the earlier stages. Cancer-related fatigue may also be related to other factors such as anemia, anxiety, depression, and side effects of treatment. Daytime sleepiness is a key feature of obstructive sleep apnea (9). However, sleepiness and fatigue are not the same. Sleepiness is the inability to remain fully awake or alert during the day while fatigue is a subjective lack of physical or mental energy interfering with daily activities. Nonetheless, people with sleepiness due to obstructive sleep apnea use terms like fatigue, tiredness, and low energy to describe their symptoms. Several neurological conditions may be associated with fatigue. For example, tiredness is often a prominent symptom in patients with stroke, multiple sclerosis, and Parkinson’s disease. It is important to look for symptoms or signs of central nervous system disease when evaluating patients with chronic fatigue. Fatigue may be present in several neuromuscular disorders such as Amyotrophic Lateral Sclerosis (ALS), Post-Polio Syndrome (PPS), Guillain-Barre Syndrome, Immune Neuropathy, Charcot-Marie-Tooth Disease, Myasthenia Gravis (MG), Metabolic Myopathy, Mitochondrial Myopathy, Muscular Dystrophy, Facioscapulohumeral Dystrophy, Myotonic Dystrophy (26). Hence, it is important to look for muscle weakness and signs of neurological disease when evaluating patients complaining of tiredness. Several gastrointestinal disorders may be associated with fatigue. Examples are peptic ulcer disease, gastroenteritis, inflammatory bowel disease (IBD), cancer, and irritable bowel syndrome (27). However, patients with gastrointestinal disorders will usually have other complaints as well, such as abdominal pain, nausea, vomiting, constipation, or diarrhea. Tiredness may be a sign of underlying heart disease. Therefore it is important to look for symptoms such as chest pain (28) and shortness of breath (29). The most common heart attack symptom in men and women is chest pain or discomfort. However, only half of women who have heart attacks have chest pain.Women are more likely than men to report back or neck pain, indigestion, heartburn, nausea, vomiting, extreme fatigue, or problems breathing (30). Heart failure occurs when the heart muscle is weakened and cannot pump enough blood to meet the body’s needs for blood and oxygen. In some cases, the pumping capacity of the heart muscle is preserved, but left ventricle is stiff with decreased compliance and impaired relaxation, which leads to increased filling pressure in the left ventricle. Heart failure affects between 1–2% of the general United States population and occurs in 10% of those over 65 years old (31). Chronic obstructive pulmonary disease (COPD) refers to a group of conditions that cause airflow blockage leading to shortness of breath, cough, mucus (sputum) production and wheezing. It includes emphysema, chronic bronchitis, and in some cases asthma. Tobacco smoke is the leading cause of the development and progression of COPD in the United States (32). Genetic factors, exposure to air pollutants, and respiratory infections also play a role. COPD was the third leading cause of death in the United States in 2014 (33). Although shortness of breath is the most common symptom of COPD, many patients complain of fatigue (34). Psychiatric illness is present in 60-80 percent of patients with chronic fatigue (35,36). Anxiety and depression are common causes of fatigue. The tiredness is usually persistent but may vary in intensity. Up to three-quarters of patients with chronic fatigue also have mood or anxiety disorders. It has even been suggested that chronic fatigue is an atypical form (forme fruste) of anxiety or depressive states (37). In other words, chronic fatigue might be just another form of anxiety or depression. Some people with depression experience total lack of energy sometimes called ‘anergia’. There is evidence to suggest that depression may predispose individuals to subsequent fatigue (38). On the other hand, fatigue and depression have been found to predict and influence each other in time. Their association could partly be due to some common risk factors that give rise to both. For some, fatigue will come first; for others, depression will come first, but for most, it will probably be unclear (39). A person with somatization disorder is preoccupied with numerous “somatic” (physical) symptoms. The symptoms often cause significant distress and interfere with daily life. However, the person’s complaints cannot be explained by an underlying medical disorder. Patients with somatization disorders often complain of pain or fatigue. Symptoms are often of gastrointestinal nature, such as nausea, bloating, and diarrhea. Erectile dysfunction is a common complaint in men. Women may experience menstrual irregularities. Neurological symptoms such as impaired coordination, difficulty swallowing, loss of touch or pain sensation, and double vision are often present. It is important to understand that the patient is not faking. His/her complaints are real. Somatization disorder usually begins before the age of 30 and is more common in women than men. Patients with somatization disorder often undergo numerous medical tests before the psychological cause of their distress is identified. Fatigue is often associated with alcohol and drug addiction. It is also experienced by many individuals following withdrawal from these substances. Many common pharmaceutical drugs have been linked to causing chronic fatigue. Fatigue is believed to be a common side effect of many conventional pharmaceutical drugs. These may be both over the counter drugs and prescription drugs. Many drugs used for the treatment of high blood pressure are linked with fatigue. Cholesterol-lowering drugs like statins may also cause tiredness. Statin drugs are used by millions of people worldwide and are also known to cause muscle pain and muscle weakness in some individuals. Antihistamines, commonly used to treat allergies, are known to cause fatigue. Treatment with benzodiazepines, antidepressants, and antipsychotic drugs is also linked with tiredness. The same is ture for opoid drugs which are commonly used for pain relief. Contrary to many other medical symptoms, fatigue is an entirely normal phenomenon in particular situations. We all become tired, but it usually gets better by rest or sleep. However, chronic fatigue as a medical symptom is typically persistent and not relieved by rest. Chronic fatigue is a common and often disabling medical complaint. An underlying medical disorder is found in approximately 10 percent of patients with chronic fatigue. Up to three-quarters of patients with chronic fatigue also have mood or anxiety disorders. If an underlying medical or psychiatric condition is not found, chronic fatigue syndrome (CFS) should be considered. Patients who don’t have an underlying medical or psychiatric condition and don’t fulfill the criteria for CFS or fibromyalgia may be considered to have idiopathic chronic fatigue. Treatment of fatigue will depend on the underlying cause. General measures should focus on sleep, healthy diet, regular exercise, and stress reduction.